The native form of this personal name is Bajnai György Gordon. This article uses the Western name order. György Gordon Bajnai (pronounced [ˈɡordon ˈbɒjnɒi]; born 5 March 1968) is a Hungarian entrepreneur and economist, who served as the seventh Prime Minister of Hungary from 2009 to 2010. In March 2009, following Prime Minister Ferenc Gyurcsány's announced resignation, Bajnai was nominated by the ruling Hungarian Socialist Party (MSZP) to become Hungary's next prime minister. Bajnai became prime minister when the parliament passed a constructive motion of no-confidence against Ferenc Gyurcsány on 14 April 2009. Bajnai was born in Szeged and raised in Baja, Hungary, the son of György László Bajnai and Ágota Sóvári. He finished his secondary studies there in 1986. He graduated from the Budapest University of Economic Sciences (now Corvinus University) International Relations Department in 1991. For his public and professional activities he was rewarded Pro Universitate Award. Bajnai was not a Hungarian Young Communist League (KISZ, Kommunista Ifjúsági Szövetség) leader, like Gyurcsány (who was Vice-President of the communist youth organization in 1989), but he was active in youth-politics. In 1987, Bajnai organized a boycott of the University of Economics' canteen, and was chairman of the Independent Student Council. He was also the head of the History Department of Studium Generale, Admission Preparatory Studies College. In 1989, he, alongside András Schiffer, participated in the organization of the short-lived New Generation Movement (ÚNM), founded and led by Gyurcsány. After earning his master's degree, Bajnai took a job at Creditum Financial Consulting Ltd (at the same time Ferenc Gyurcsány worked there as well). In 1993, he undertook an internship at the European Bank for Reconstruction and Development in London. Later he also worked for Eurocorp International Finance Ltd (again under the directorship of Ferenc Gyurcsány). Between 1995 and 2000, Bajnai was the managing director of CA IB Securities Co., and was the Deputy Chief Executive Officer (at the same time when András Simor, later head of National Bank of Hungary, was the head of the company). Bajnai was involved in the management of introducing several major companies to the stock exchange. Between 2000 and 2005, he was CEO of Wallis Rt., an investment company. His duty was to restructure the company, make it more efficient and to manage its investments. Wallis group member companies were at that time Graboplast Rt., Rába Rt., Elender Rt., Index.hu, Wallis Ingatlan, Wallis Auto Holding, Danubius Radio, Café Advertistment. In 2003, the National Association of Managers selected Bajnai as the "Young Manager of the Year". Among the more than 100 Wallis-owned companies a poultry processing firm, Hajdú-Bét went bankrupt during 2003, against all efforts by its management and owners. Many partners of Hajdú-Bét suffered serious losses during the time when the poultry market collapsed in 2003, Wallis group itself lost 10 billion forints (over 40 million Euros). There were news circulating about possible related suicides linked to the bankruptcy among farmers. Years later, when he started his political career, Bajnai was criticized for the Hajdú-Bét collapse, although won lawsuits against media-outlets for false accusations. In 2005, he was President of Budapest Airport Inc., and member of the Supervisory Committee at Zwack Inc. He was a member of the Corvinus University of Budapest Economic Council. He resigned all of his company posts and board-memberships, when he entered the government as government commissioner, responsible for EU funds and national development. Bajnai first received a government post in 2006. On 1 July, Prime Minister Ferenc Gyurcsány's called on him to be the Government Commissioner for Development Policy. In this position, he maintained supervision over National Development Agency, that controls EU Funds to Hungary. He became minister in July 2007, in the Ministry of Local Government and Regional Development. After SZDSZ left the coalition government, in May 2008, he took over the newly formed Ministry of National Development and Economy. In March 2009, Prime Minister Ferenc Gyurcsány resigned, announcing that he would hand over his position to a new premier with a higher support of the parties of the Hungarian Parliament. The Alliance of Free Democrats (SZDSZ) opposed most candidates for the post proposed by the Hungarian Socialists. Although Bajnai was reluctant to give in, after a week, with no tangible results in sight, and being asked by the majority of party stakeholders, who also assured him of their support of the needed austerity measures, he took the job. 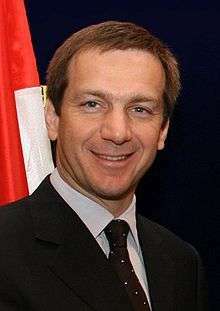 Securing the backing of both parties, Bajnai became prime minister on 14 April 2009. The Hungarian Parliament elected Bajnai as Hungary's Prime Minister with 204 votes for, 8 abstentions. The remaining 174 MPs did not vote. In his first speech as PM, he promised drastic measures to stop the negative spiral of the Hungarian economy, and to ease the burden of the international crisis. He also stated that he would remain in power until he had the solid majority of Parliament behind his austerity package, but will stay no longer than a year. He did not want to nominate himself on the next election; he undertook the task for only a year. Attila Mesterházy became the Hungarian Socialist Party's candidate for the position. The MSZP suffered its worst result since the 1990 elections. The sixth National Assembly of Hungary formed on 14 May 2010. In accordance with the Constitution of Hungary Bajnai became "acting Prime Minister" for the following days. In his last speech he raised word against the Jobbik fearing for democracy given the party's radical views. The new cabinet formed on 29 May 2010. Bajnai was succeeded by Viktor Orbán. After that he retired from politics and returned to business life. Bajnai took over an economy that was expected to contract by 6 percent in 2009 and was kept afloat by a $25.1 billion IMF-led lifeline. Foreign investors were declining to finance Hungary's high budget and then current account deficits, and the forint's weakness threatened hundreds of thousands of families who took out foreign currency mortgages. Bajnai must have had to cut spending to rescue the budget, keep within IMF guidelines and regain investor confidence. Handling the ruling Socialists might have been his most difficult task. He needed their votes but a sizeable section of the party viewed Bajnai with contempt because cuts in welfare spending was seen as eroding the party's traditional voter base. Despite of this, Bajnai made a reform in taxes, pensions, public sector bonuses, maternity support, mortgage subsidies, energy subsidies and public transport subsidies. Within six months, he managed to present a new budget that reduced government spending by five percent. Hungarian economic policy has regained its credibility, CDS-spread was less than one third of the level of a year before. His first visit abroad was in Brussels, where he debuted as Prime Minister. He had discussions with Jose Manuel Durao Barroso, President of the European Commission, and with Jaap de Hoop Scheffer, Secretary-General of NATO. Gordon Bajnai with Barroso in Brussels. In April he met with Austrian PM Werner Faymann, in May, he attended the EU Partnership Summit in Prague. In May, he presented a speech on the Europe Forum, in Wachau, and in June, he attended the V4 summit in Kraków. He made a two-day official visit to Israel, where he met Shimon Peres, Benjamin Netanyahu and the Opposition Leader, Tzipi Livni. He also visited the Palestinian Authority, where he met the Palestinian prime minister, Salam Fayyad. The Nabucco pipeline's intergovernmental agreement between Turkey, Romania, Bulgaria, Hungary and Austria was signed by five Prime Ministers (including Bajnai) on 13 July 2009 in Ankara. On 19 August, he met with Angela Merkel, Chancellor of Germany, in Sopron. The event was the 20th anniversary of the Pan-European Picnic. In September he made a short official visit to Finland, where amongst others he met Prime Minister Matti Vanhanen. On 10 September, he invited the Slovak PM Robert Fico to ease the tensions between Hungary and Slovakia. There were a clash of views between the two neighbors concerning the controversial amendment of the Slovak State Language Act. The two premiers expressed regret over the circumstances of a failed visit by President László Sólyom to Komárno on 21 August and agreed to accept all recommendations of the Organization for Security and Co-operation in Europe high commissioner on national minorities. Prime Ministers Gordon Bajnai of Hungary and Robert Fico of Slovakia signed a joint statement during their meeting in Szécsény. Published on the Hungarian government spokesman's website, the statement declares the two countries' common interest in easing political tension. Bajnai and Fico agreed to direct the attention of all political parties to the social risks of confrontation, and called upon the citizens of both countries to show tolerance and understanding. They agreed to take resolute measures against extremist groups, and fight against all forms of xenophobia, intolerance, chauvinism, nationalism and violence, and the exportation thereof to one another's country. The two premiers declared that bilateral relations should be based on confidence, transparency and a pragmatic and constructive bilateral dialogue. They agreed to use all forms and instruments of cooperation, including further prime ministerial meetings. Bajnai with U.S. President Barack Obama and U.S. First Lady Michelle Obama. Between 20–24 September, Bajnai made an official visit to the USA, where he met President Barack Obama, the UN secretary general Ban Ki-Moon, he attended the Climate Conference of the UN. He visited The Wall Street Journal's editorial office. Amongst others he had discussions with George Soros, Charles Gati, and major U.S. financiers and investors, he closed the day's trading at the New York Stock Exchange. In early October, Bajnai made a visit to the United Kingdom. He attended talks with Prime Minister of the United Kingdom Gordon Brown and gave a public lecture at the London School of Economics and Political Science. Between 18–19 October, he made a short official visit to Paris, where he met president of France Nicolas Sarkozy, PM François Fillon, and many French investors. Hungary sent more troops to Afghanistan in line with then current US strategy to enhance involvement there, Bajnai announced at a meeting with US Vice President Joe Biden in the White House on 4 December 2009. The pledge been made in several steps during 2010: Hungarian troops mainly serve in logistics and training operations, on top of helping to secure elections in Afghanistan, Bajnai told journalists after the talks. Several months after retiring from public service, he founded the Patriotism and Progress Public Policy Foundation with some of his former government members and independent experts, which states on its , that its goal is "to shape the world view and attitudes of our citizens to build a better Hungary". "To realize this dream we will actively pursue a progressive agenda by learning from best practice and empowering communities to better themselves. We will amass and tutor the expertise and know-how to assist Hungary in facing the many tests it has to pass on the road to modernization." During the Autumn of 2011 he took up lectureship at Columbia University in New York, Rutgers University in New Jersey and Johns Hopkins University in Washington D.C.
Bajnai announced his return to politics on 23 October 2012, during the anti-government demonstration of the One Million for Press Freedom (Milla). On the protest, he called for an anti-Orbán coalition so as to form a supermajority in Parliament with the help of which the changes done by Orbán's ruling party, Fidesz could be undone. In his speech, Gordon Bajnai repeatedly used a variant of the term ("We may fail on our own, but together, we shall prove victorious! "), when he proclaimed his support for such a "cooperation between hopeful left-wingers, disappointed rightwingers, politically abandoned free-thinkers and committed Greens" that his organization along with two other civilian body named Together 2014 (later simply known as "Together") as a reference to the date of the next general election in Hungary. In December 2012, Bajnai announced that he intends to be a parliamentarian candidate in the 2014 general election. On 14 January 2014, five opposition parties entered into a coalition and formed Unity alliance. Contrary to his earlier plans, Bajnai could not reach to become joint Prime Minister candidate of the left-wing opposition since Attila Mesterházy (MSZP) was appointed to that position. Unity suffered a heavy defeat in April election, nevertheless Bajnai was elected to the National Assembly from the second place of the alliance's joint list. Bajnai resigned from his parliamentary seat on 26 May 2014. Gordon Bajnai retired from Hungarian politics for the second time in September 2014, when he was named Group Chief Operating Officer of the Paris-based Meridiam investment fund. Bajnai said that his new job would not impact his political career in Hungary, and he would remain leader of Together, although that title is largely honorary, since he did not to take an active part in its activities. However commentators on both the left and right political wing agreed that Bajnai was quitting politics with that step. Bajnai is married, but separated from his wife, having two children together. Bajnai has one child from his partner with whom he has been living since 2004. His fourth child, a boy, was born in June 2012. Bajnai has played soccer from early childhood; he is one of the players of Hungarian football club Építők SK. Bajnai plays as a goalkeeper. According to the team's homepage the Prime Minister was the Footballer of the Year in 2001 at the club. In an occasion of a preparatory match against Grund FC he was seriously injured. In 1994 he was awarded Pro Universitate. In 1999 he was voted one of the 30 most promising Central-Eastern European business executives by the journal Central European Business Review. In 2003, the National Association of Managers selected Bajnai as the "Young Manager of the Year". 2006 Officer's Cross Order of Merit of the Republic of Hungary (Civic Order of Merit) as an acknowledgement for his exceptional professional and company management work and his achievements in the area of company management culture development. 1 2 Edith Balazs and Charles Forelle (31 March 2009). "Hungary's Ruling Party Picks Premier". WSJ. Retrieved 14 February 2015. ↑ "BBC NEWS - Europe - Hungary parties back Bajnai as PM". Retrieved 14 February 2015. ↑ "A csődbiztos - A Bajnai Gordon-sztori 1. rész". 2008-06-18. Retrieved 2014-01-15. ↑ Dudás Gergely. "Index - Gazdaság - Bajnai Gordon: A politika a legösszetettebb hivatás". Retrieved 14 February 2015. 1 2 3 4 5 6 "Bajnai György Gordon (1968 - napjainkig)". doksi.hu. Retrieved 2014-01-15. ↑ "Index - Belföld - Bajnai Gordon visszaszól". Retrieved 14 February 2015. ↑ "Bajnai Gordon szétoszt 8000 milliárd forintot". 2006-07-07. Retrieved 2014-01-15. ↑ "Válság, adósság és az EU közt lavírozott Bajnai". 2009-04-03. Retrieved 2014-01-15. ↑ "Hungary remains vulnerable to turmoil, says PM". Financial Times. Retrieved 14 February 2015. ↑ "In Hungary, Potential Lessons for Greece". Retrieved 14 February 2015. ↑ "Pulling Hungary back from the precipice". Retrieved 14 February 2015. ↑ "Europe gas pipeline deal agreed". BBC News. 2009-07-13. Retrieved 2009-07-13. ↑ "Hungarian, Slovak PMs adopt joint statement". The Budapest Times. 2009-09-10. Retrieved 2009-09-10. ↑ "Bajnai szerint Obama hálás Magyarországnak". Origo.hu. 2009-09-24. Retrieved 2014-01-15. ↑ "Kétszáz újabb katonát küldünk Afganisztánba". Index.hu. 2009-12-04. Retrieved 2014-01-15. ↑ "Bajnai's office confirms former PM moving to New York for two months". Politics.hu. Retrieved 14 February 2015. ↑ "The Politics of the Eurozone Crisis". Retrieved 14 February 2015. ↑ "Bajnai said to announce return to politics on October 23". Politics.hu. Retrieved 14 February 2015. ↑ "BBC News - Mass rallies mark 1956 Hungary uprising". BBC News. Retrieved 14 February 2015. ↑ "Bajnai says plans to run for Parliament; in car accident in Budapest". Politics.hu. Retrieved 14 February 2015. ↑ "Quotable: Antal Rogan on the opposition coalition". 2014-01-14. Retrieved 2014-01-14. ↑ "Multicégnél helyezkedik el Bajnai Gordon". 2014-09-02. Retrieved 2014-09-15. ↑ "Véget ért Bajnai Gordon politikai pályája". 2014-09-15. Retrieved 2014-09-15. ↑ "43. sz. Épít?k SK". Retrieved 14 February 2015.